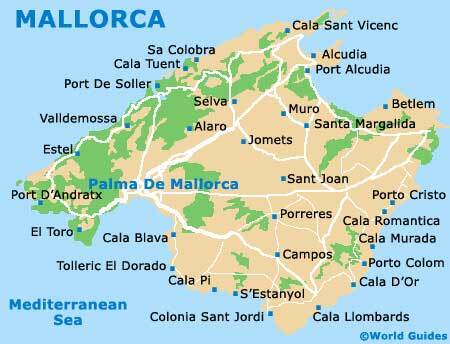 There are a large number of churches, cathedrals and religious buildings to be found in this historic island of Mallorca. 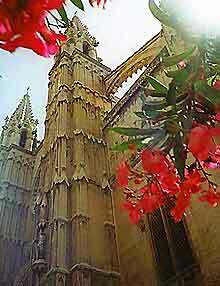 The Gothic Santa Eulalia church in Mallorca is simply vast and stands proudly at the end of Carrer Morey. The church was constructed in the 13th century on the site of a mosque and was completely in just 25 years, which was quite an achievement at that time. Mallorca's Santa Eulalia has many interesting features, including magnificent original Gothic paintings and a crucifix reputed to have been carried by Jaume I when he conquered Mallorca in 1229. 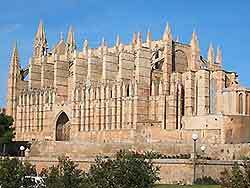 Mallorca's enormous Gothic cathedral is situated in the Palma region of Mallorca and stands close to the shore. Construction began in the early 13th century and lasted until the year of 1601. The cathedral towers high over the town and is built of golden sandstone. Mallorca cathedral is one of Spain's most outstanding Gothic structures and is without doubt the most precious architectural treasure in the Balearic Islands. It is best viewed from the sea, or at night, when it is brightly illuminated and looks quite spectacular. The magnificent church in Mallorca took almost a whole century to construct and its façade is decorated with a rosette and Baroque-style portal. In the 17th century the church was badly damaged by lightning and was remodelled shortly afterwards. Highlights include many fine works of art, which are mainly Baroque in style, a vast altarpiece dating from 1739 and a beautiful organ.